I told my husband today that I’m slightly… odd. I’ve been spending my alone time lately taking a bath while reading a book or playing Pokemon Shuffle. That’s semi-normal, right? But I got derailed from my Christmas movies, which is what I usually watch once I’m in my pajamas and curled up in bed. 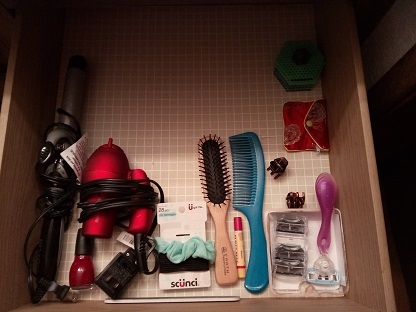 Instead, I’ve been watching a YouTube blogger share her progress from hoarder to minimalist. And that’s fun for me! It’s motivating in my own challenge and fun to watch someone else make progress in their attempts to create a more peaceful home. Today I tackled a drawer in our bathroom. 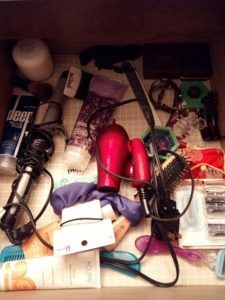 The drawer was a mess! Expired sunscreen, random hair bands, jewelry I never wear, and loose hair. Yuck! I dumped everything out of the drawer, scrubbed it down, and only put back what I want to keep. I moved a few things like lotions and face wash under the sink and tidied what was left. It’s not going to stay organized, since I don’t have any containers to keep it from sliding around every time I open the drawer. But at least there is less to rummage through while I’m looking for something. And my girls keep running off with my hair dryer so I bought them each one for Christmas! One blue and one pink. I think they’ll be pleased.